Subscribe now! You will be able to take advantage of special offers reserved for subscribers and will be kept up to date with all the news from Grand Hotel Terme Astro. 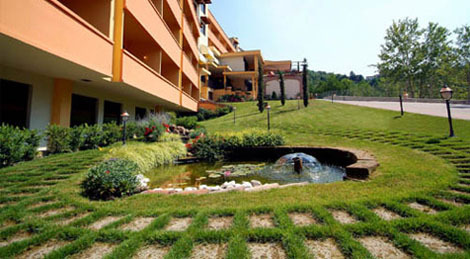 Grand Hotel Terme Astro is located just kilometres away from several of Emilia’s cities of artistic interest popular with holidaymakers. The Hotel, which already offers a myriad of amenities, will epitomise everything you have ever dreamed of in terms of wellness, fun and sport. This four-star hotel has 115 bedrooms, with a total capacity of 218, all of which are elegantly furnished with a living area, bathroom, mini-bar, TV, air-conditioning and direct dial telephone. It also boasts a conference centre suited to events of all kinds. The refurbishment project will transform it into an exclusive resort. Entering the Hotel will be like a new age dream where all your senses will be satisfied. Your sight will be enchanted by the harmony of the architecture, the gardens and the fountains with their water features. The entire atmosphere will be impregnated by the scents of nature that has always characterised this enchanted place nestling in splendid, peaceful grounds populated by oak trees that almost form an amphitheatre.